Here are some videos of other techniques I use in the eye. Thanks to JG for letting me share this surgery! He has a complex history of retinal detachment and loss of the lens and trauma to the iris. His sight had always been poor and inspite of successful surgery for his retinal detachment it remained so and due to the large pupil he was getting glare. In this surgery I use a Seipser Slip Knot to knit together the edges of the iris to close it down and reduce the glare. Surgery was under a local anaesthetic and went well. These sutures are tiny and it is a very fiddly technique to pass the needle through a loop pulled out of the eye in different directions three times in order to lock the knot. Surgery took about 15 minutes but here are the highlights! Thanks to SF for letting me share this. 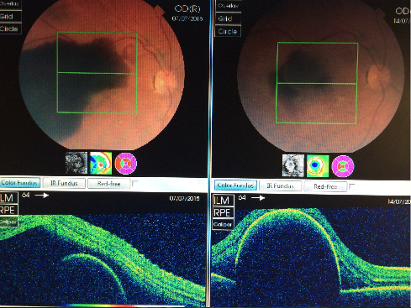 This lady noticed a sudden drop in vision and was seen by her optometrist who referred her to the eye unit. Vision got worse over the weekend and thankfully this lady came to eye casualty and was diagnosed with a large sub macular bleed. We see this infrequently as part of wet AMD. Usually in wet AMD vessels leak a little or bleed a little and patients notice distortion or slight reduction in vision and treatment is with anti VEGF injections . With a large submacular bleed the vessels suddenly rupture and progression is very rapid and sight is lost within a day at times. Treatment carries a poor prognosis but leaving these alone results in permanent loss of central vision. In this case vision was just counting fingersso not even the top line of the test chart. We elected to proceed to emergency Vitrectomy under local anaesthetic with classical music (patient request). Following removal of the vitreous gel (vitrectomy) I can gain access to the retina and then using a 41G cannula (needle) I push though the retina and then inject 0.1mls of solution containing TPA just above centre and then another injection below and to the side. TPA (Tissue plasminogen activator) is a clot busting drug. If you look carefully at the top of the bleed you can see the blood thinning and the retina lifting as it detaches with the fluid injected.The eye is then filled with air. With the eye full of air and the patient in the upright position the fluid sinks into the inferior retina and away from the macular. At one week the blood has almost completely cleared and now we can treat monthly with anti VEGF injections. 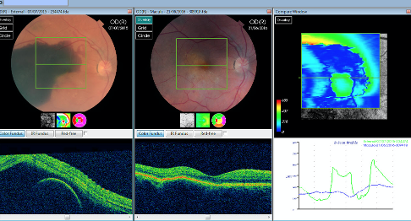 I am delighted to report that vision has continued to improve and is now 0.5 which is a quarter of the way down the test chart and this is through the cataract that has developed. We will now get on with cataract surgery and hopefully improve vision further. SF came in today and the OCT scan is almost back to normal and vision is now 0.24 or 6/9 or around driving standard. The scans on the left show the preoperative scan on the left side and today's scan on the right side. I think this demonstrates the eye's ability to sort itself out with some help from the surgeon provided the patient presents early! We are both delighted with this outcome. I am grateful to this lady who has allowed me to share her surgery. She had a brain haemorrhage (Sub Arachnoid Haemorrhage) and as a result bled into both of her eyes loosing her sight. We operated on each eye to clear the blood and this is her second eye operation. The blood that had entered her eye had collected under the superficial layer of the eye the Internal limiting membrane or ILM. Having cleared the blood this video shows the peeling of the ILM revealing the altered white granular blood which is then aspirated. The ILM behaves differently to normal ILM (See macular hole surgery) it seems thickened and tense and you will notice that at times the entire sheet lifts up when I grab to peel. Unfortunatley vision remained poor. It is difficult to predict how well people see after Terson's as some do see very well but often sight remains poor.I have heard it said that people fear blindness only second to death and this condition brings people close to both. This lady has dealt with the entire episode with great fortitude and resolve and I am hoping vision will improve a little over time.